From behind the trigger of your portal gun you blast out door ways into the unknown. 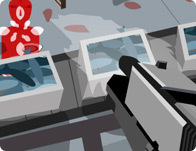 This is a puzzle, an adventure, a shooter and a tribute. Can you escape, do you want to, what will you find when you finally get out? F: Hold and drop objects.